The Network Nebula consists of NGC 6992 and NGC 6995. It is the easternmost portion of the Veil Nebula complex. In the above image NGC 6992 runs horizontally in a sweeping arc along the upper end of the frame, while NGC 6995 is the thicker, bright extension on the lower left side of the arc. This beautiful display of intertwining strands and folds of gas were formed over 5,000 years ago by a supernova explosion. 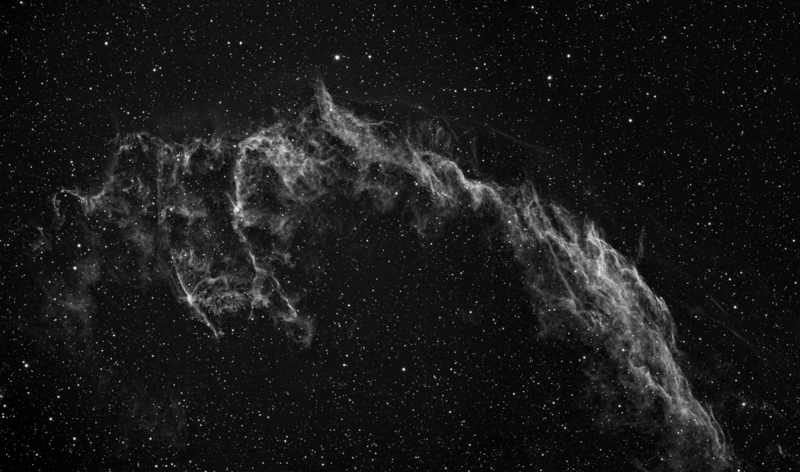 The Veil SNR is a difficult object to image from the southerly latitude of Las Campanas, Chile. At transit it rises to a maximum altitude of only 29°, with many individual frames of this image taken at altitudes down to 20° (3 air masses) over several nights, attesting to the fine seeing conditions at the observatory. This two-pane mosaic is the culmination of 11.5 hours of data collection in a collaborative effort between Howard Hedlund of Astro-Physics Inc. and Dave Jurasevich.